I was taking out the trash a few weeks ago and found a few books on top of the dumpster, one of which was What Was Lost by Catherine O’Flynn. I grabbed it up and started reading without even glancing at the description on the back. No expectations, that was my goal. It started out kind of dull and boring for me. The first 50 pages or so were told from the point of view of Kate Meaney, an 8 year old girl who spent her days inventing and solving crimes. I found the whole thing mostly uninteresting. Then, all of a sudden, the book skipped forward about 20 years or so. It turns out that Kate Meaney, while out investigating a crime, had gone missing. Various characters were blamed for her disappearance and the remainder of the book followed the stories of several people. It wasn’t initially clear how they tied into the story of Kate Meaney and as it all unfolded I found myself spellbound. This book literally left me breathless and immobile with fear. I have not read a book this fantastic in a long time. It is completely different than the stuff I typically read and I am so glad to have accidentally rescued this gem from the trash. 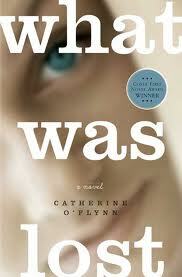 This entry was posted in book reviews and tagged book review, fiction, o'flynn. Bookmark the permalink.